Pianist Eliko Akahori has performed as a soloist, chamber musician, and collaborative pianist to great acclaim on four continents. Recent performances include Berg’s KammerKonzert with violinist James Buswell, and recitals with bassist Edwin Barker and saxphonist Ken Radnofsky. 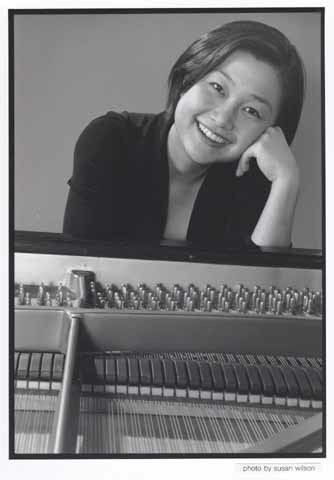 In 2003, Ms. Akahori received the first prize, Coleman-Barstow Award in the 57th Coleman Chamber Ensemble Competition. She has also collaborated in chamber music concerts, recordings, radio and television programs with members of the Berlin, Chicago, Montreal, Boston, Vienna and San Francisco Orchestras, among others. Ms. Akahori is currently pursuing her Doctorate in collaborative piano at the New England Conservatory of Music, where she completed a Masters of music in Theory in 1999. She has worked as a collaborative pianist with the Conservatory faculty and students alike, including those from the studios of Paul Katz and Donald Weilerstein. While pursuing her Bachelor’s degree at the Kunitachi Collage of music in Japan, Ms. Akahori was the winner of both the Yamaha Young Artist’s Award and the Yomiuri Musician’s Award in the same year, graduating with Academinc Honors and highest Distinction in Performance. In 1996, Ms Akahori performed for the Japanese Emperor’s Family in the Imperial Palace in Tokyo.